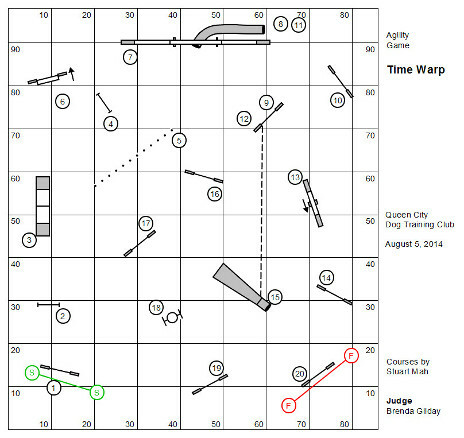 Top Dog Agility Players (TDAP) will publish each month at least one course or game to which any agility player in the world is invited to compete. These are the challenge courses. Scores for every dog who plays, no matter where in the world they played, will be rolled up into results as single event. 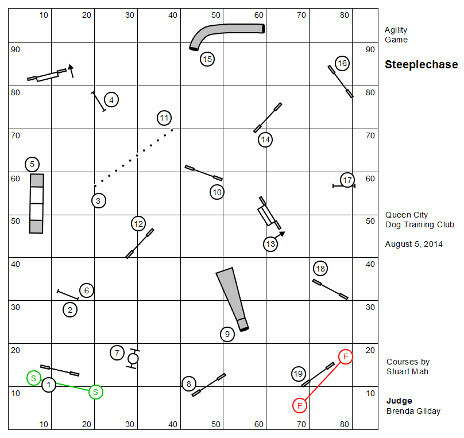 The Secretary’s Pick challenge course for the month of August, 2014 are published below! Whether you are a big club or an individual with a nice big back yard… set up these courses and play with us! All dogs who play are eligible for agility titles awarded by the TDAP. These titles are described in Our Rules! 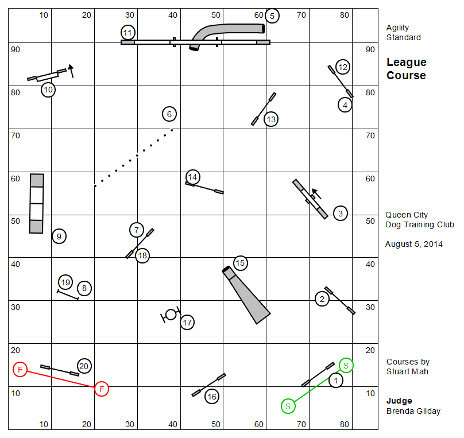 For the fun of dog agility competition we are creating team league challenge. At this time an agility team is five dogs and five different handlers. A team will combine their scores on the monthly Secretaries Pick challenge course. The high scoring team each month wins. To illustrate how a league event might work with lots of dogs: The premier event at Queen City Dog Training (August 5, 2014) will begin with two qualifying games or courses (the first two shown above). The five top scoring dogs, when their scores for the first two rounds are combined, will be designated the league team for the final round. Even though everybody will get to play the final round (the third course, shown above); only the scores of the league team will count towards the league score. We’ll be filming the premier event at Queen City Dog Training (August 5, 2014). Hopefully within the week we will be streaming The Show on the internet. Everyone around the world who competes on the challenge course will get to compare their own efforts with the stars of the Queen City program. At the same time, just so we don’t leave anyone out, we’ll make space on our Facebook page for everyone who competes to link to a YouTube of their pups performance!